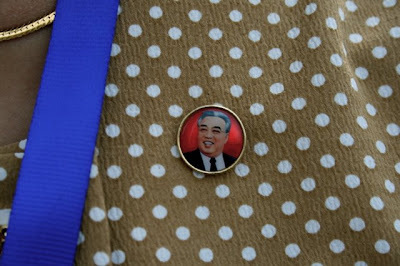 When we were in Pyongyang, The Pin was a much coveted souvenir. Everyone wanted one. But they were not available for sale anywhere. Sure, you could quite easily get one of a North Korean flag, or a torch surrounded by patriotic words exalting the victorious motherland. But a pin bearing the Great Leader’s portrait? These were not buyable. They were issued to citizens – no North Korean would dream of leaving home without The Pin. Which was why it was such a surprise when our guide presented us with a pair one morning. She had put in a special request for us, special guests. And when we carelessly suggested we might give them away to other people as gifts, she very nearly took them back. It was a major faux pas that took days of religiously showing up with Pin on our chests to put right. Just how much do the North Koreans value their pins? At the Pyongyang Restaurant in Kathmandu, a North Korean waitresses squealed when shown The Pin – they don’t normally wear one in Nepal. The young lady picked it up very carefully, whipped out a piece of tissue and polished the little disc to a shine. Then she took out another piece of tissue and wrapped it up before giving it back. All throughout, she barely spoke a word but the message was clear – The Pin is sacred. Treat with care.